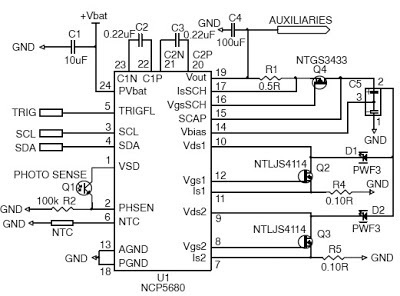 This white LED Driver circuit project is based on the NCP5680 high efficiency white LED Driver ic. NCP5680 supports double power flash LED and torch operation . The built-in DC/DC converter is based on a high efficient charge pump structure with 1X, 1.5X and 2X operating modes. 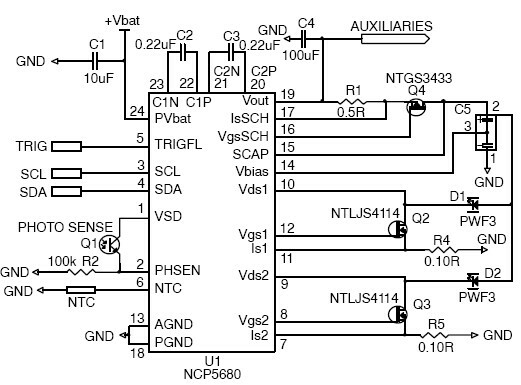 The NCP5680 controller is designed to properly drives large external NMOS device with accurate control of the peak current flowing into the LED. Also, the NCP5680 chip includes Open Load and Overload Detection circuit to protect the system against faults at Vout or LED level. Main features of the NCP5680 are : 2.7 to 5.5 V Input Voltage Range , Dual Power Flash LED Capability , Integrated Overload Protection , Selectable Flash/Torch Mode of Operation , Programmable SuperCAP Re−cycling Current , Capable to Share the DC Voltage to Supply Peripheral Circuits , Indicator LED Function , Integrated Photo Sense Function , Support Camera Strobe , Built−in Short Circuit Protection , Selectable Flash Time Out Safety Timing , Support External NMOS up to 10 A Load Capability , Fully I2C Protocol Compliant , Support GSM Synchronization , Built-in LED Test Function.